No, no….not that kind of butterfly! 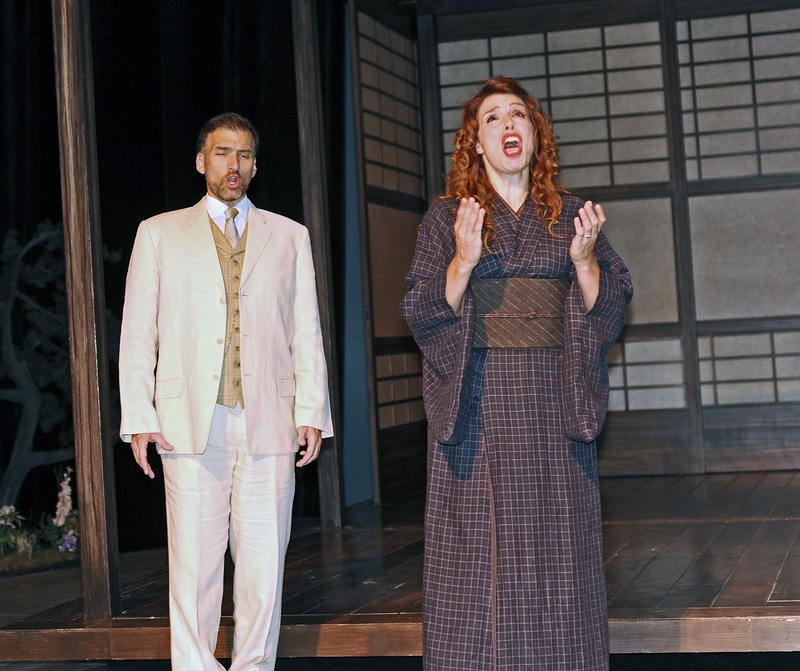 I’m referring to Puccini’s Madama Butterfly presented by Amarillo Opera this weekend at the Globe News Center. 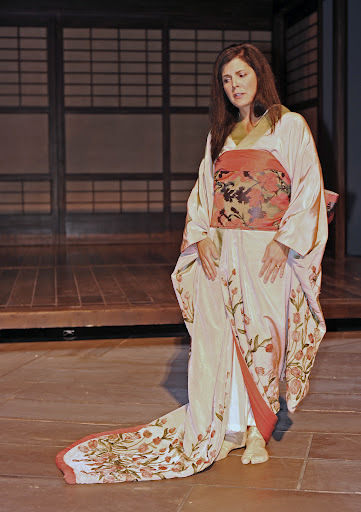 For us opera neophytes that would be Mrs. Butterfly, I guess. There is a show Saturday evening September 29 and a Sunday matinee on September 30, so you have two chances to catch this magnificent undertaking. I’m not gonna pretend to tell you all the plot intricacies of Butterfly, because I’ve never seen it. I know it’s Puccini…it’s dramatic…and Butterfly is a treat visually as well as aurally. The set is from SANTA FE OPERA. All the people ‘in the know’ and the technicians declare it is a BIG, impressive set. A ‘3-trucker’, I believe. The set was made possible with a generous donation from a local, opera-loving couple. The structure has the ability to move about the stage. Very impressive. Thank you for this kind gift to our community! I was lucky enough to get a sneak peek of the set and some of the principal performers. I’m always stunned with the talent and impressive sound of these singers. The costumes are sure to be breathtaking, as well. Don’t be surprised if you hear some sad songs….it is Puccini, after all. So proud of our local Opera Company. 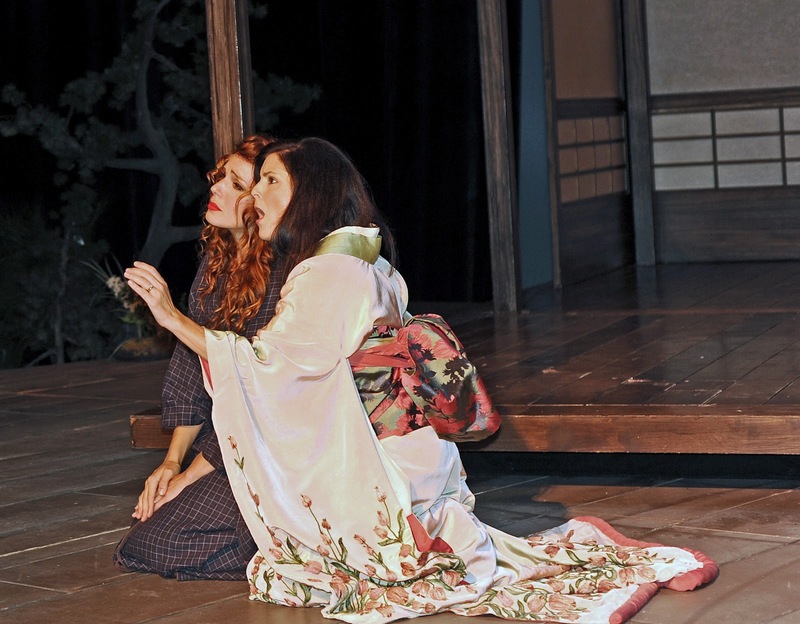 Madama Butterfly has been a seminal and historic work for Amarillo Opera. It’s amazing to me that a production of this caliber….with the impressive principals, the gifted singers in our local chorus, the talented conductor and our versatile local symphony musicians can unite to put something so special together in our fantastic Performing Arts Center. It’s a monumental undertaking, really. Time to hatch from your larva stage. You don’t want to miss this. It’s gonna be EPIC! Call AMARILLO OPERA for tickets. Yesterday was the big unveiling of my new, mending left arm!! 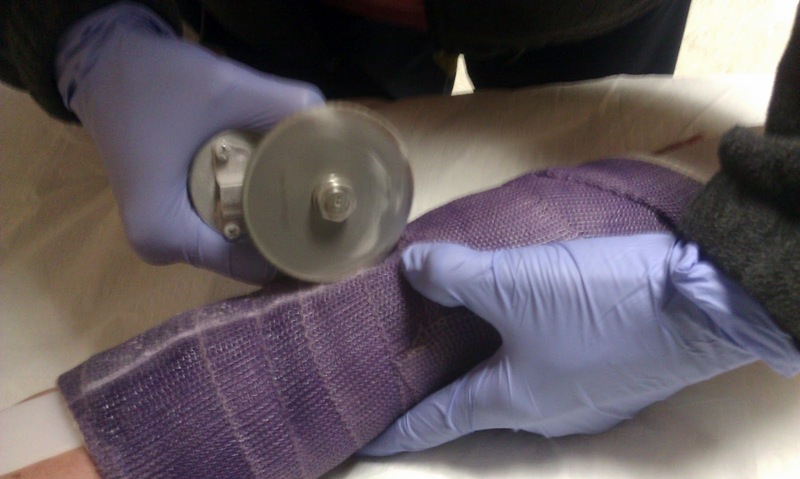 Sawing off the purple cast. 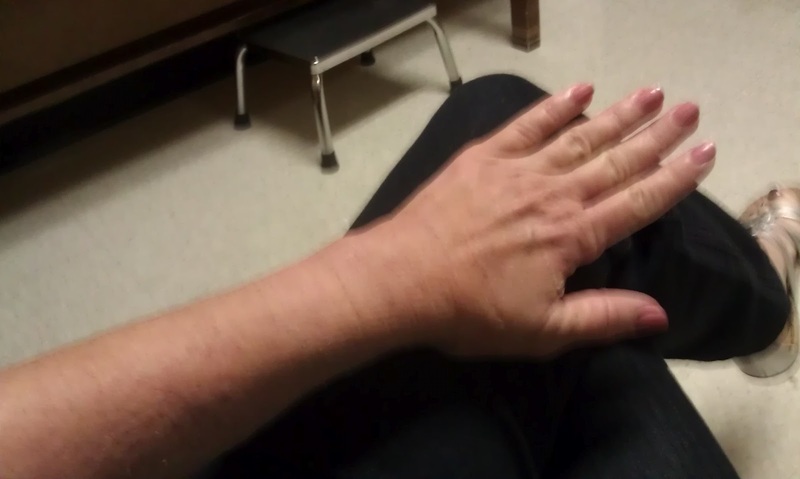 The cast was off, and here are the first photos of my liberated wrist. The arm looked pretty good. Some dead skin and flakiness, but nothing too gross. 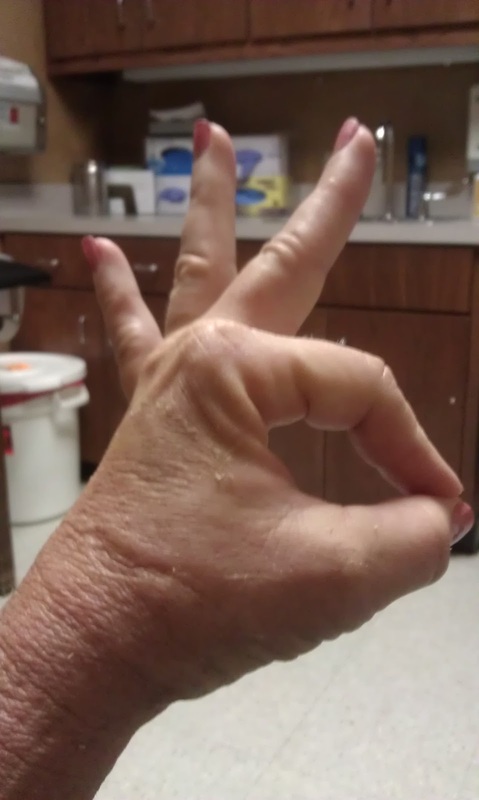 Although feeling pretty stiff and sore, the hand gives the ‘thumbs up’. Of course! How could I so cruelly discard my beloved purple exoskeleton? 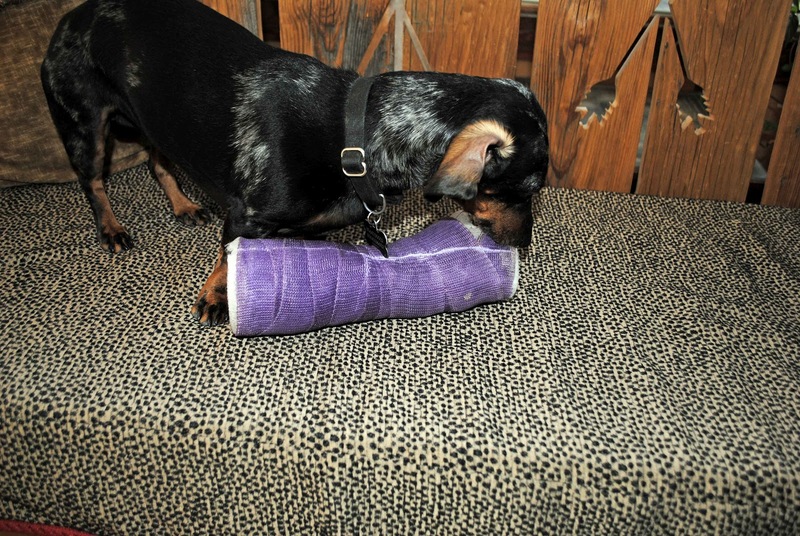 Showed the purple cast to Roxy Doxy. While Doxy took meticulous notes on possible ideas to reuse the purple cast, I was glorying in washing my face….with BOTH hands. I indulged in a one arm spa treatment with warm water, soap and a washcloth. Followed it up with a liberal dose of lotion. Heavenly. Here’s my new chic arm covering for the next 3 weeks. 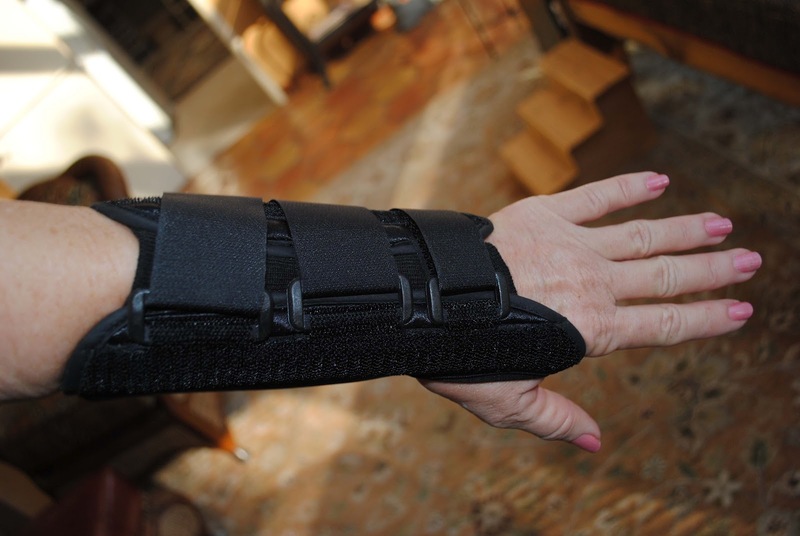 Say ‘hello’ to the lovely black splint! I’m working through the expected stiffness and soreness. It will take time and a large dose of determination to regain good use of this wrist. Good thing I’m determined and fairly patient. Mainly for now, I’m grateful. Supremely and utterly grateful. My patience could be wearing thin, however. Caught a glimpse of THIS last evening. 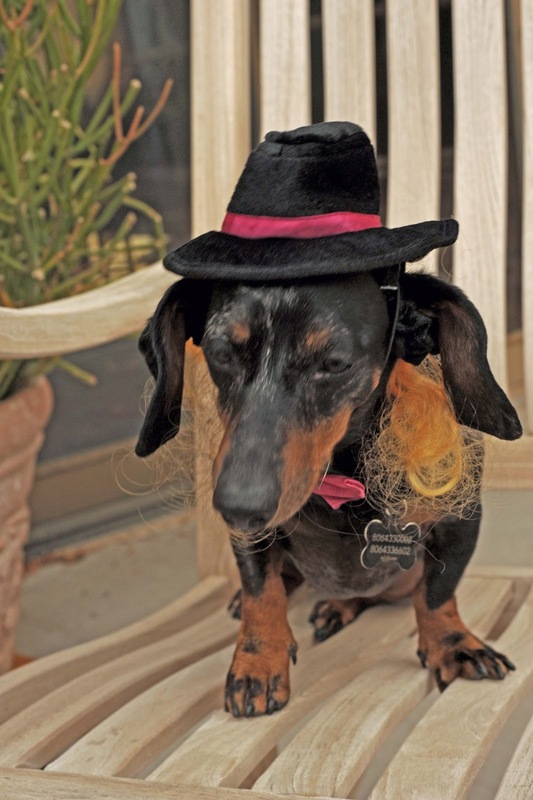 A certain, stubby-legged pooch seems to be preparing costumes for Halloween. It’s not EVEN October! Life with the purple cast has gotten easier and I’ve regained lots of mobility in my fingers and in other parts of my arm. Amazed every day at the healing power that comes from God. So grateful for it, and I wish the same healing power to all those experiencing sickness and injury. The purple cast has been lifting weights! It started with a 1 lb. weight and it was spotted at the gym today heaving a 7.5 pound weight! It can do shoulder presses, hammer curls and tricep kick-backs. Can’t stand to look at the bowl of mush that used to be my pretty-well-defined (for an old gal!) upper arm. The purple cast was unable to lift a gallon jug of milk from the fridge this morning, but look out-it’s bound to happen before too long. 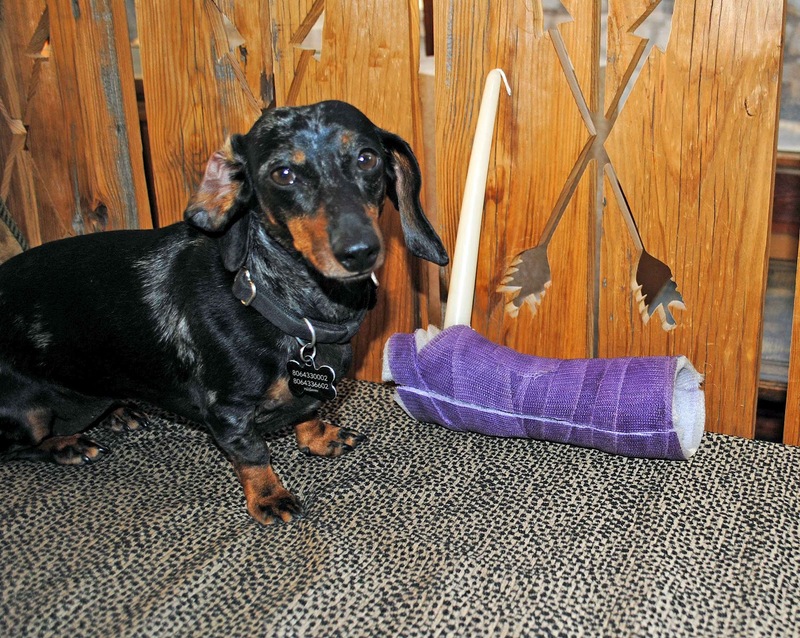 Counting the days until purple cast gets sawed off. 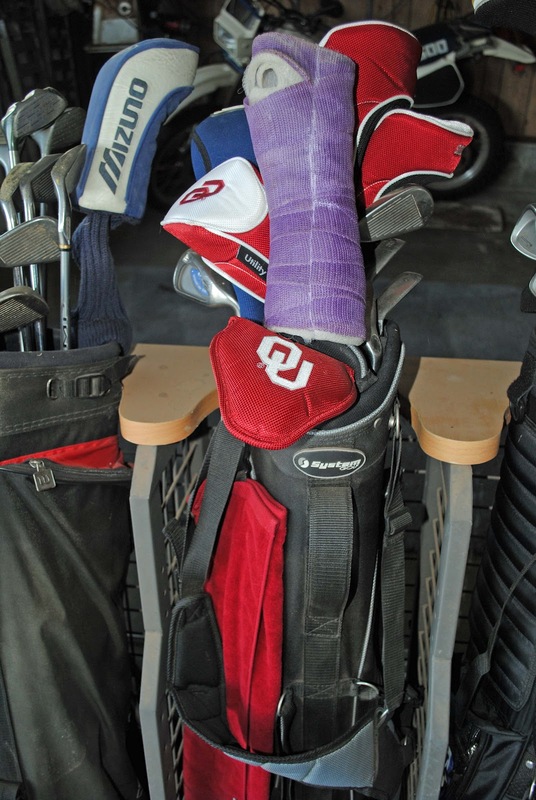 I know, I know….there’s rehab ahead of me, but I’m ready to get to it. Five days, five days…..FIVE DAYS, ELEVEN HOURS!! Here’s how I’ve been counting down. Friday night, the Texan and I kept this imp. Been feeling really useless as a baby-sitter lately. Baby G is very mobile now and he hasn’t missed any meals, if you know what I mean. 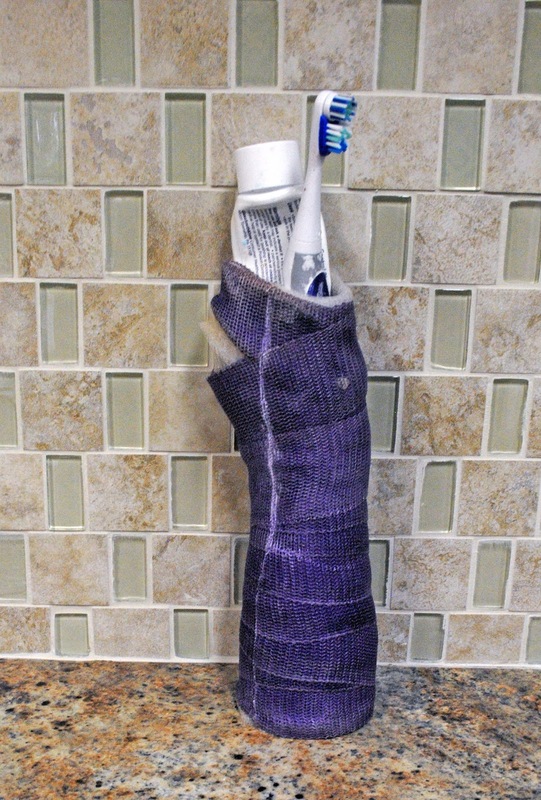 The purple cast couldn’t do a thing for a while. But NOW, I can kinda pick him up and I can change a diaper. Even with two good arms, G can be a challenge. 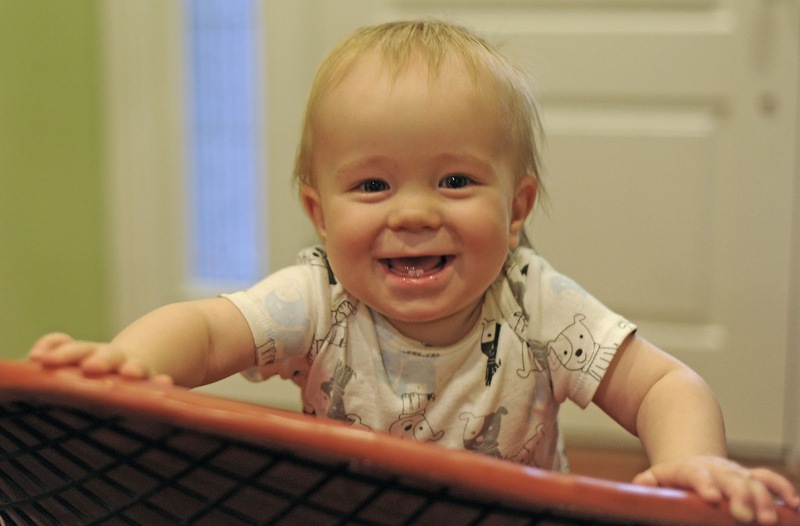 He’s coming up on his first birthday. KK loves you, baby G! This past weekend was spectacular; cooler weather and blessed little wind. Perfection. Took the purple cast out to pull weeds in the secret garden on Saturday. The cast made a lackluster effort to pull weeds, but it was amused by the wildlife. 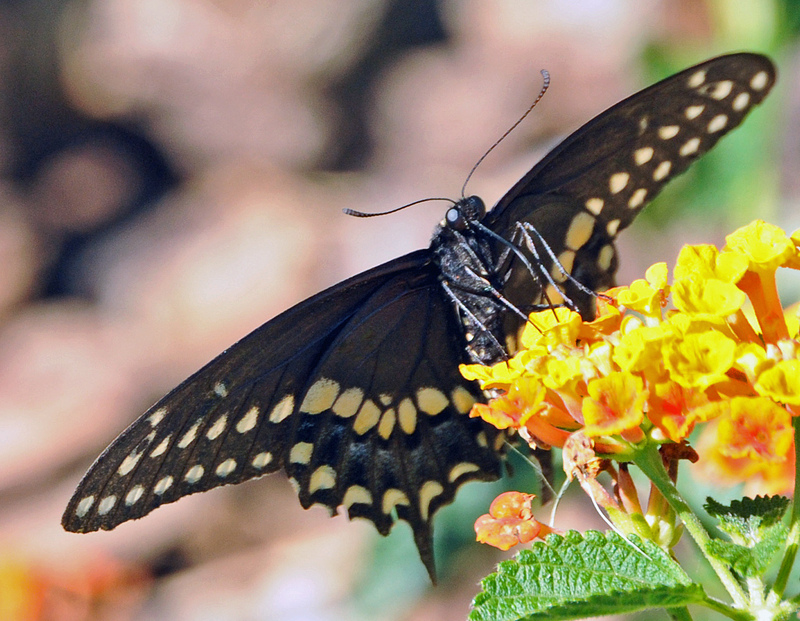 The butterflies are really loving the lantana, and many of them visit every day. 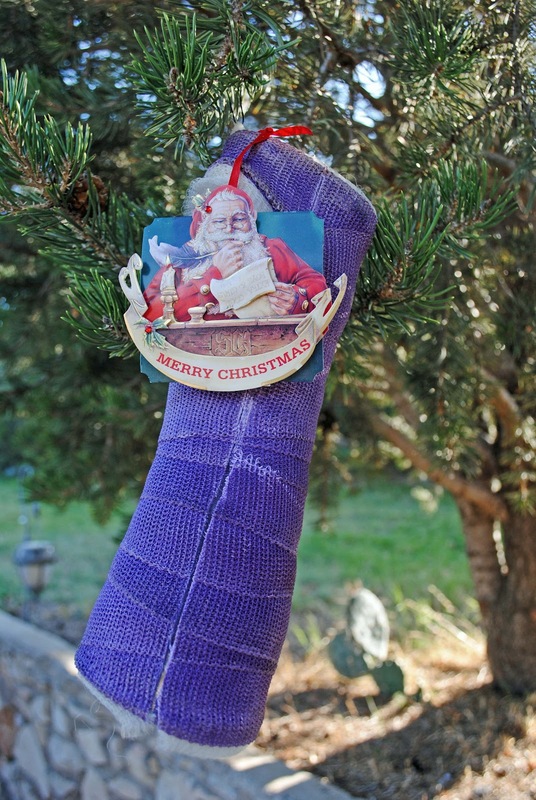 While he should have been weeding and working, the purple cast sighted another visitor. Don’t know the name of this critter. Do any of you know what these are called? 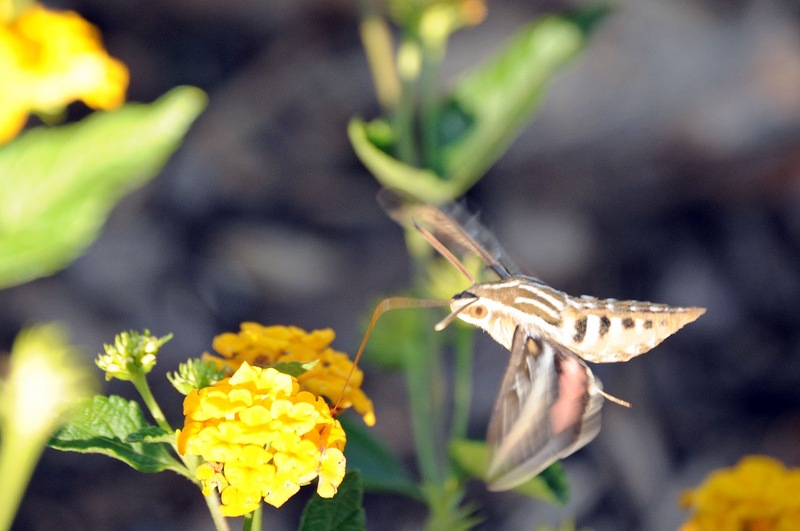 I call this a hummingbird moth. Guess I should Google the real name. There were several of these guys buzzing around, while the purple cast and I were weeding. They made us smile. Decided to cook dinner on the patio, since the weather was unusually outstanding. Grilled steaks, made a crisp salad, and boiled a few green beans (in bacon, of course) for our dinner. While were were dining al fresco, the Texan noticed a visitor. 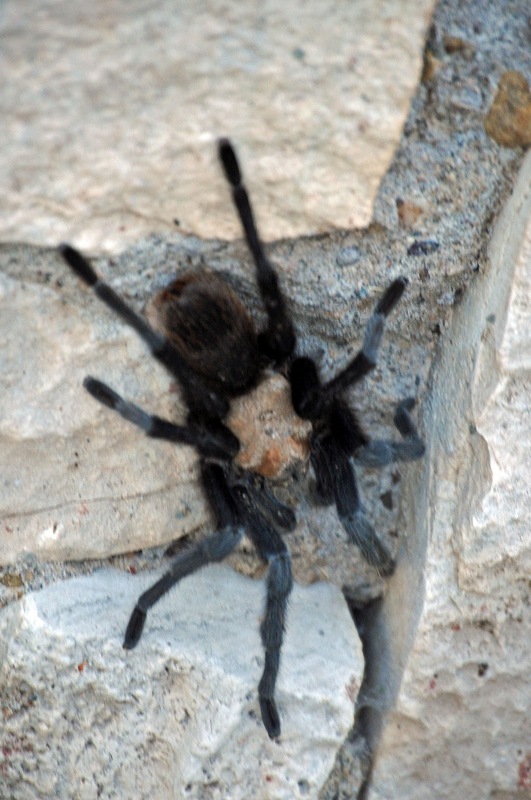 Fall is the season for tarantulas around here, and folks are spotting them everywhere. Was traumatized when one jumped in my entryway the other night as I was taking the unsuspecting doxy for an evening walk. The Texan saved us and herded the spider outside. 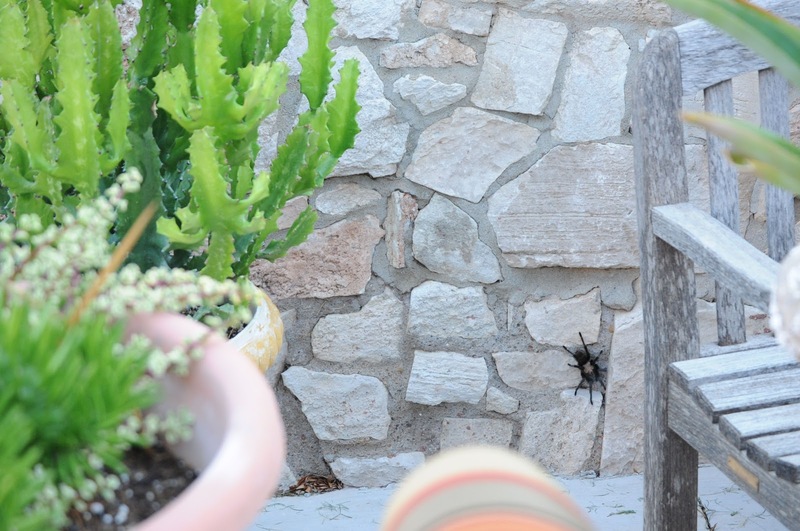 The tarantulas are pretty harmless and it’s kinda fun to spy them creeping around this time of year. Don’t ask me where they spend their time during the other seasons of the year…..I’ve no idea. Hopefully not in my secret garden. Five days, five days, FIVE DAYS…..10 and 1/2 hours! I’ll let you know how it goes. Probably make you look at pictures, too! The purple cast is giving all of you a thumbs up.